Celebrity Machines has produced the only metal stamped screen accurate prop replica available. This plate is a must have for any Seinfeld fanatic or prop collector! Each plate is brand new, made in the USA, and individually shrink-wrapped. We ship both domestic and international. All plates are in stock and shipped within one business day. Feel free to drop us a line with any questions you may have about this plate. Excellent quality replica that is exactly as described as well as show in the photos. This piece is very true to the original and those fans of the show, this is a must buy at a great price. Thank you and I will definitely be a repeat customer! I highly recommend this seller. Exactly as described! Very pleased with purchase. Payment is due at the time of checkout. We accept Etsy Gift Cards, PayPal, and credit cards via Etsy Direct Checkout. We are always happy to exchange or refund your item if you’re not happy with it, or if it gets damaged in the mail. Please contact us for prior authorization of any returns. - If your order arrived damaged. - If an item was received in error. - If you seek a replacement or an exchange for reasons other than damage or loss. - If you provided an incorrect shipping address at checkout. - If for any reason you were unable to collect your package at customs. We drop all orders off at our local post office daily - Monday through Saturday. All orders are processed and shipped within one business day. Our default shipping method is USPS First Class Mail. We ship from Indianapolis, IN. Priority Mail packages are usually delivered within three days of shipping, but USPS does not guarantee delivery by a certain date for Priority or First Class packages, so unfortunately, neither can we. We are happy to ship Priority Mail or Priority Mail Express for an extra charge. Shipping upgrades are available at the time of check out, when using a web browser to access Etsy. We do ship internationally; however, we cannot promise your package will arrive by a certain date. Sometimes packages are held up in Customs for seemingly no reason, and transit times vary wildly. For example, we have had packages reach the UK anywhere from 2 days to 24 days after sending. We ship overseas via DHL Express, unless that is not a cost-effective option for your region, in that case we will ship First Class Mail International. We are not responsible for any additional customs tariffs or charges that your country imposes on your package, nor can we predict what they might be. EXAMPLE: CAN YOU MAKE ME A LICENSE PLATE THAT LOOKS LIKE THE OUTATIME CALIFORNIA PLATE BUT SAYS MY NAME INSTEAD OF OUTATIME? Unfortunately, Travis is unable to take on custom work. EXAMPLE: IN THE OPENING CREDITS OF LA LAW, THERE IS A LICENSE PLATE THAT SAYS "LA LAW". 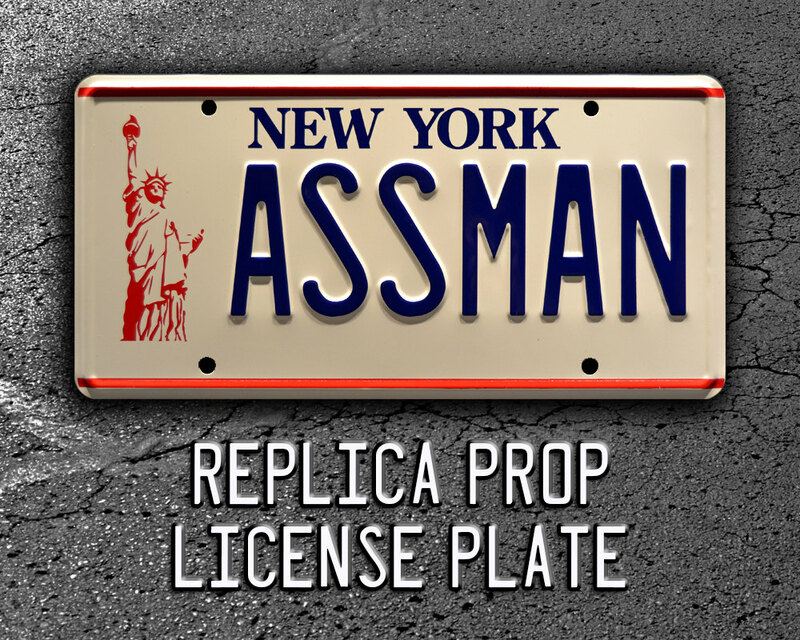 I REALLY WANT THIS PLATE AND I DON'T SEE IT IN YOUR SHOP, WILL YOU MAKE IT FOR ME SINCE IT'S A REPLICA PROP AND NOT JUST A CUSTOM PLATE? Possibly! As we explained in our About Me section, this whole business was started due to a need for one particular license plate. We now offer 114 different plates, and that is all due to requests from the fans. So by all means, send us your request and we will add it to our never-ending list of To-Do plates. Please note that this does not guarantee that we will ever produce this plate, just that it will be taken into consideration. **And for the record, look for the LA LAW plate to be released in our shop in 2016!